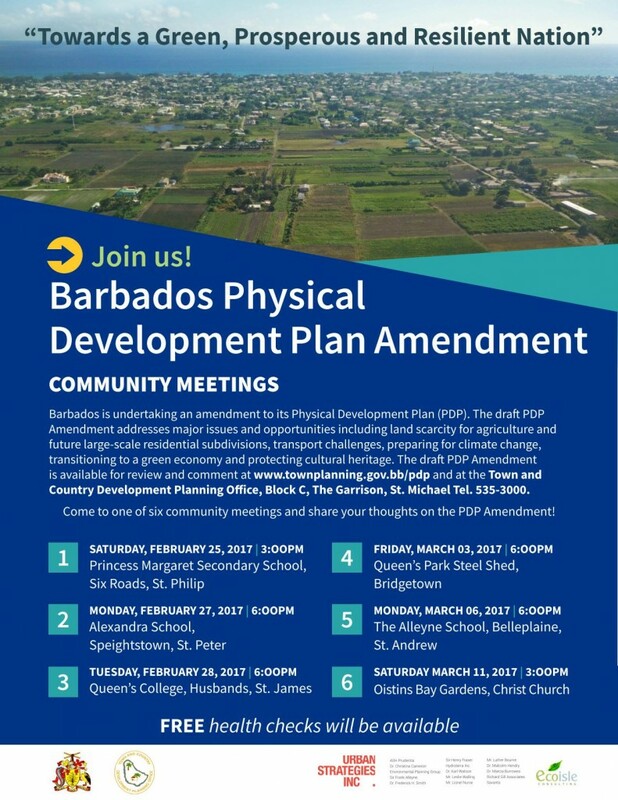 The Physical Development Plan Amended 2017, for Barbados is intended to provide a vision for sustainable growth and development of the nation by setting out policies to guide relationships among land uses, built form, mobility, community facilities and physical infrastructure. It is also intended to be a framework to facilitate and guide investment, both public and private, in Barbados to the year 2035 to advance a healthy, prosperous and resilient nation. The Town & Country Planning Office will be accepting comments regarding the Draft PDP Amendment 2017 until 15th March 2017. Comments can be submitted to the email address pdp@townplanning.gov.bb or via the comment form on the PDP website (see link below). The PDP can be downloaded in sections from there as well. There are also a series of community meetings planned. See below flyer. Next → Next post: Court decision will make planning delays worse!